Is Samsung Smart Glow the next step in evolution for the LED notification? A new type of LED notification system will be featured in the upcoming Galaxy J2 (2016) as per reports. In fact, we may begin to see this feature embedded in all future Samsung smartphones soon enough. The news was shared by GalaxyClub.nl after they found the feature mentioned in the upcoming J2's leaked manual. The hardware of the Smart Glow feature is a pretty simplistic LED ring that's capable of flashing in various colors. As you can see in the image, the ring will be encompassing the rear camera module of the phone. Now, the usefulness of the LED ring lies in its functionalities and here are the ones we know about at this time. 1. You will be able to set specific colors for specific contacts, so when a notification arrives, you will know who it is from, even without turning the phone around and from a distance. 2. It will indicate low battery like regular LED notifiers do. 3. The Smart Glow will enable the user to take efficient selfies with its rear camera as well, because it will emit a blue light as soon as the subject's face is within the sensor's viewfinder. Personally, we like the last one the most and users will probably find it to be the most useful as well. 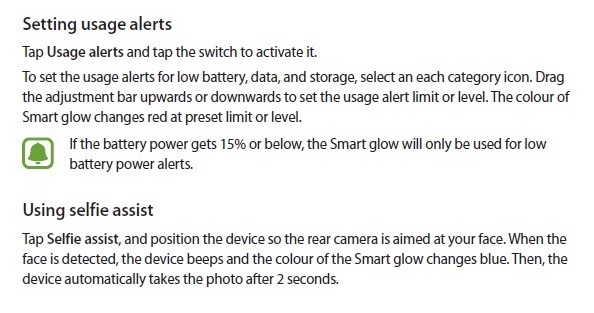 Tags: samsung smart glow next step evolution led notification? 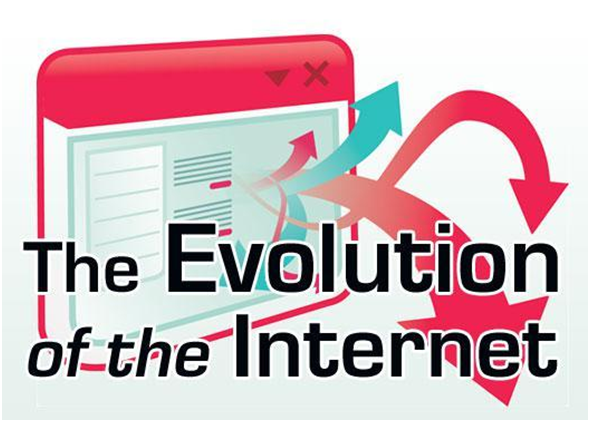 Today, Samsung released an Infographic that showcases the Evolution of communication technology starting from 1st Generation (1G) to the 4th Generation (4G LTE-A) smartphones. The infographic first presents the Samsung SH-100, a bulky device that was launched way back in 1988 as Samsung's very first mobile phone. It then takes us through the mid 1990s (with the Samsung SCH-100, the world's first commercialized CDMA phone), and through the early 2000s (when the SCH-E100 was released as the world's first 3G, 1X EV-DO handset). Not long after that, HSDPA became available at about the same time with the rise of smartphones. Next was LTE, however, the world's first LTE-capable handset wasn't a smartphone: it was the Samsung SCH-R900, a featurephone with a WVGA touchscreen display and a sliding QWERTY keyboard. 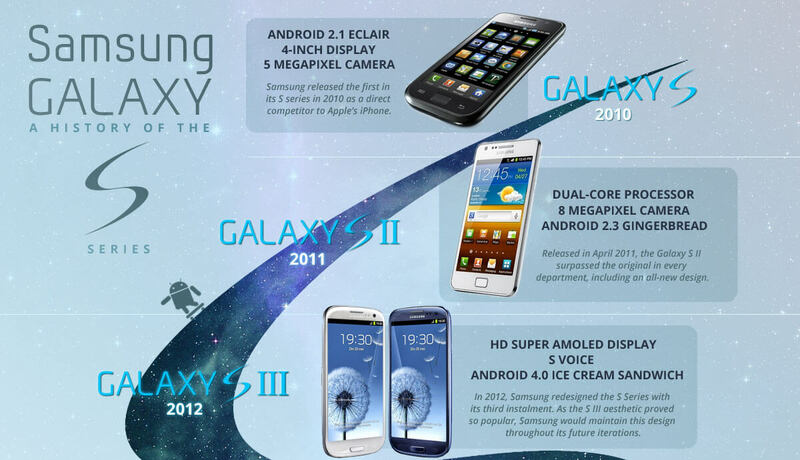 The Galaxy S II, Galaxy S III, Galaxy S4 LTE-A, and the Galaxy S5 Broadband LTE are also mentioned. 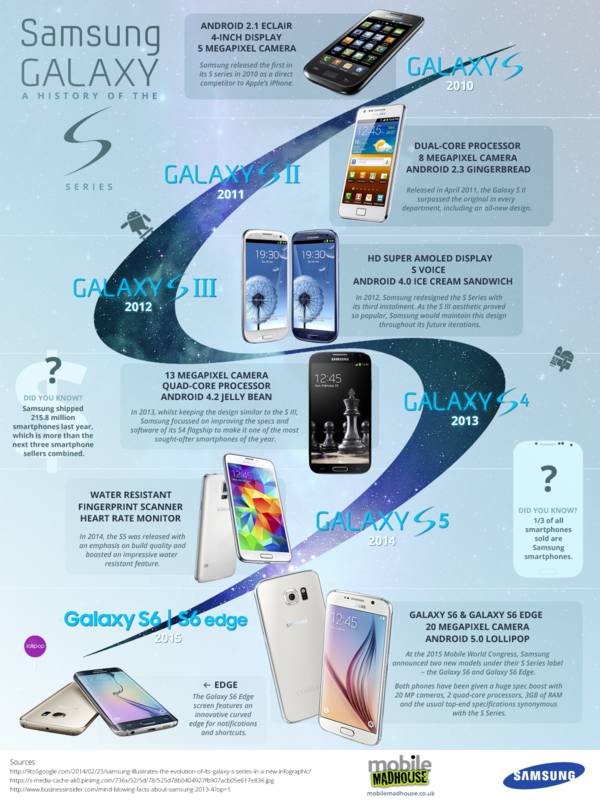 Samsung today posted a video that presents the evolution of its Galaxy S flagship smartphones, from the original Galaxy S to this year's Galaxy S6 and Galaxy S6 edge. As some of you may remember, the very first Samsung Galaxy S was launched in the first half of 2010. With its 4-inch WVGA (480 x 800) display and its single-core 1 GHz processor, the Galaxy S is obviously a low-end device by today's standards. Next year, in 2011, the Galaxy S II introduced a dual-core 1.2 GHz processor and a larger, 4.3-inch display, though the pixel resolution remained unchanged. The Galaxy S III (2012) brought us a quad-core processor and a 4.8-inch 720p display, while the Galaxy S4 (2013) was the first in the series to offer a 1080p display (a 5-inch). Last year's Galaxy S5 came with a 5.1-inch 1080p display, a water-resistant body, heart rate sensor, fingerprint scanner, and a 16 MP rear camera. Finally, Samsung's current flagships, the Galaxy S6 and S6 edge, offer 5.1-inch Quad HD (1440 x 2560) displays, octa-core Exynos processors, 3 GB of RAM, up to 128 GB of storage space, and bodies made out of metal and glass. Unlike the regular S6, the S6 edge features a dual curved screen which differentiates it from all other smartphones out there. 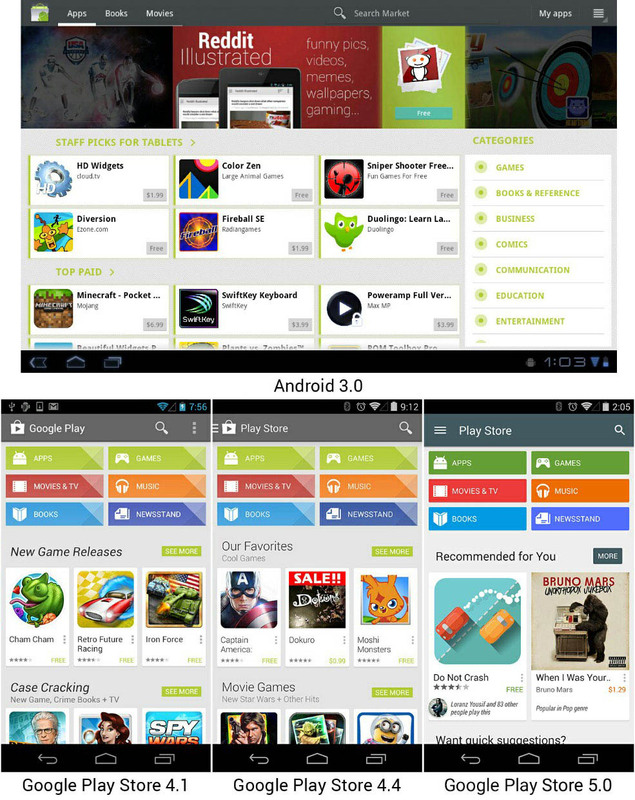 Google improved Android's market App a lot since the launch of Android 1.0 on 2007 and its re-branding to Google Play Store. 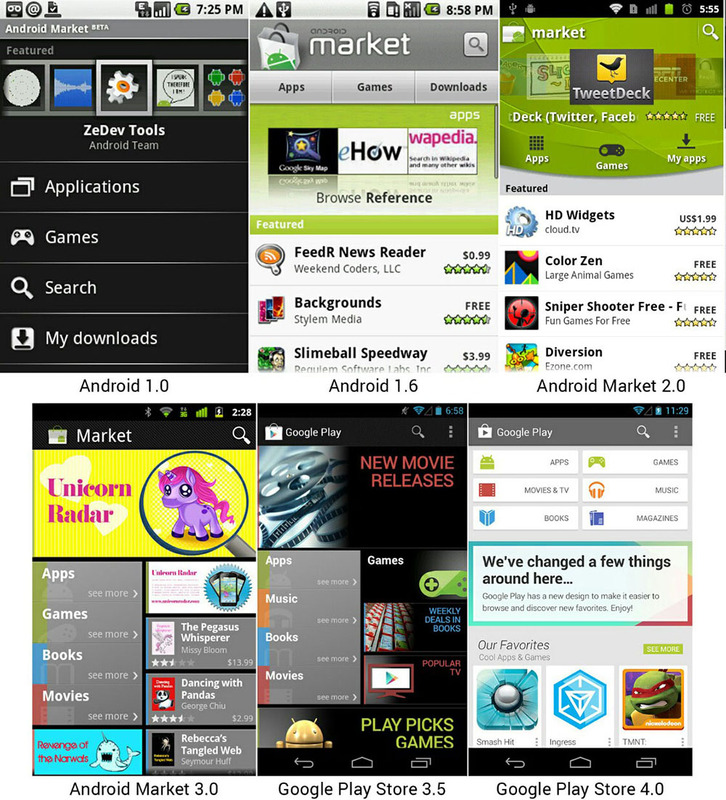 We gathered some screenshots of the Market app from Android market v1.0 to the Google Play store App v5.0 that was released yesterday. Google done a great job on improving the UI of the App. SMS texts or through Viber, WhatsApp, Facebook Messenger, iMessage ...etc. 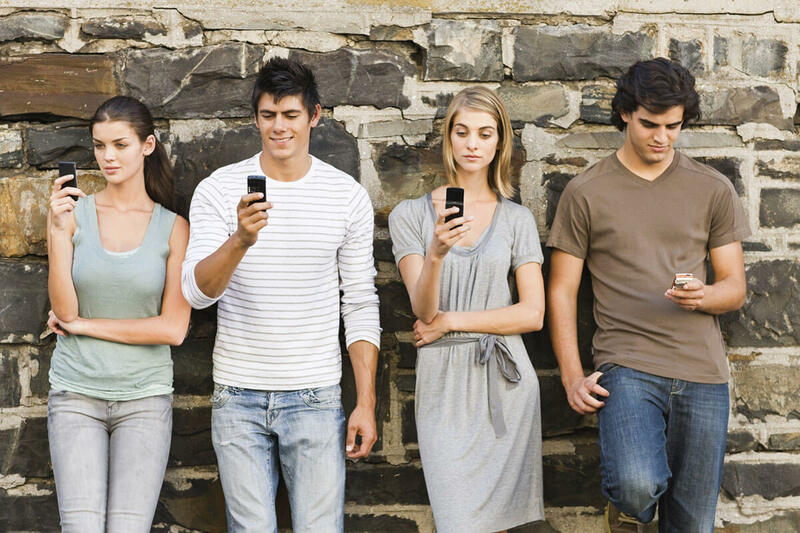 modern people are seemingly putting texting on top of all other forms of communication that their mobile gadgets are offering. Thanks to a new Infographic by Neon SMS, we get to explore the history of texting, from the inception of the SMS to its current state. Indeed, the above-mentioned messaging services are a pretty harsh competition to regular SMS texts, but the latter are certainly here to stay. Check it out!